Skin tones can range from dark, golden brown to the pale, pinkish-white hues. The term ‘pigmentation’ refers to the skin’s natural colour, irrespective of any sun exposure. In our skin we have pigments called melanins that are produced by melanocyte cells to provide natural protection against ultraviolet (UV) rays from the sun. Dark spots, skin discolouration, blotchiness, ephelides (freckles) and melasma, are all common skin concerns that are associated with excess pigmentation, also called ‘hyperpigmentation’. Hyperpigmentation is the overproduction of melanin resulting in darkening of the skin. 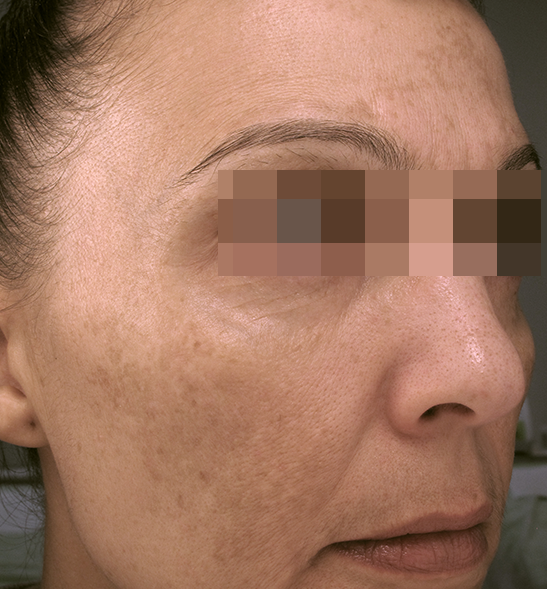 Often this excessive melanin production forms clusters in localised areas resulting in patchy skin tones or dark spots. 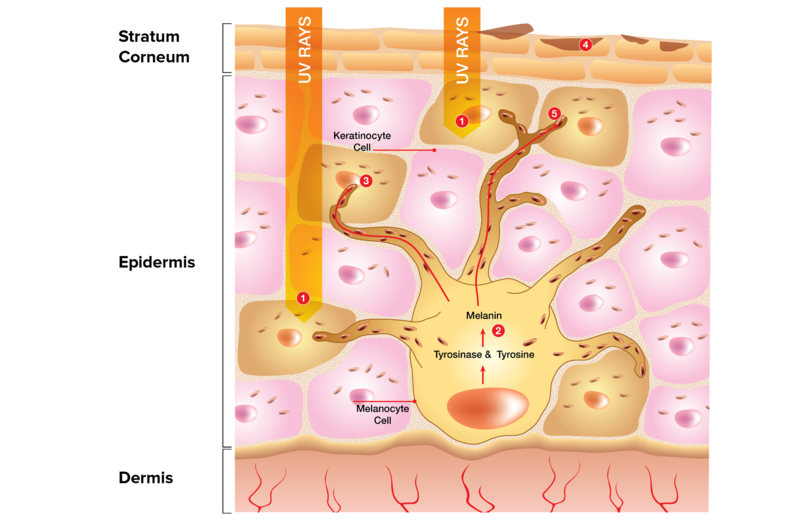 What causes hyperpigmentation & age spots? The sun is the most common cause of excessive pigmentation production, as ultraviolet rays stimulate the production of free radicals* that in turn, stimulate the production of melanin. The excess melanin forms clusters, which result in uneven patches, forming freckles, liver or age spots, or general blotchiness on the surface of the skin. 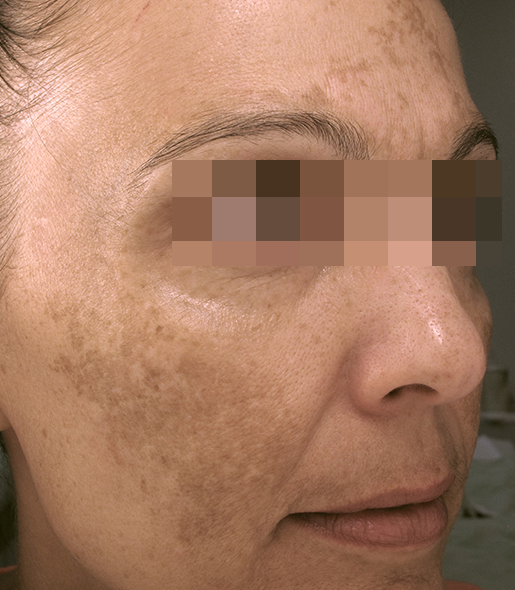 This type of hyperpigmentation is usually located in areas of the skin most often exposed to the sun, such as the hands, face, arms, shoulders and forehead. Hormonal changes in pregnancy and menopause can also cause hyperpigmentation, as the hormones can stimulate melanocytes to produce more melanin. This is known as melasma and manifests with patches of hyperpigmentation on the face including the forehead, cheeks, upper lip and chin. There is often a family history of melasma and it usually first occurs during pregnancy. *Free radicals are simple molecules with an electron missing. To try to become 'whole' again, they steal an electron from other molecules within the body and in so doing, cause small changes to our physiology each time. How is Hyperpigmentation from UV damage formed? Ultra violet rays intiate the formation of free radicals. UV light, together with free radicals, triggers biological agents that act on the pigment-producing cells, called melanocytes. Biological agents act to increase production of the pigment-producing enzyme called Tyrosinase. Tyrosinase processes the amino acid Tyrosine to form melanin pigments, which can have either a red or brown hue. Melanin is transferred as granules from melanocytes into surrounding keratinocytes to give the skin its colour. Melanin is lost from the skin as cells migrate to the surface layers and are shed through the skins natural exfoliation process. A great place to start is to book in for a professional skin consultation, where a trained Skin Technician can create a customised skincare program of homecare and professional treatments to look after your skin. 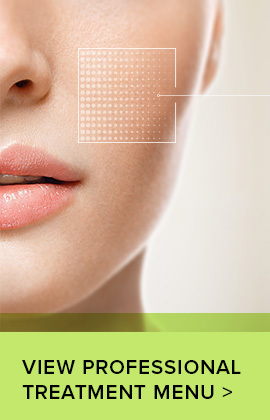 In-clinic treatments such as peels and microdermabrasion help to target the apperance of discolouration. Apply topical products containing brightening and exfoliating ingredients that work together to achieve the best possible results. Use a Daily UV Protective Moisturiser to protect your skin from the sun every day and to prevent further damage. 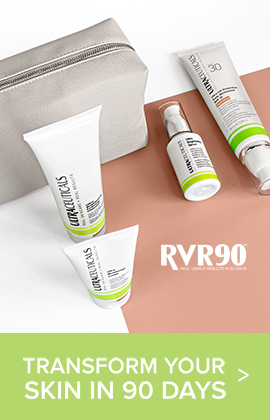 Naturally derived ingredients such as oxyresveratrol, bearberry and alpine plant extracts, including Melissa officinalis, have been demonstrated to be helpful in fading the appearance of dark spots and discolouration. 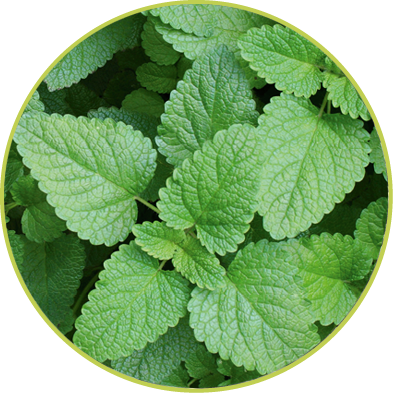 Melissa officinalis, also referred to as balm mint, common balm, or lemon balm, is a perennial plant native to Southern Europe. Melissa officinalis is a member of the mint family, deriving its name from the Greek word for honey bee (Melissa), due to the fact that the small white flowers are like magnets to bees, attracting them to their blossoms regularly because of their sweetly scented nectar. 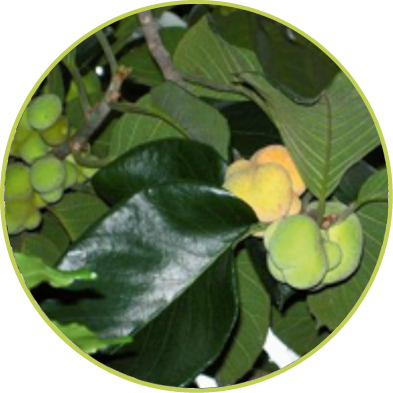 Oxyresveratrol is found in some plants such as white mulberry and monkey Jack. 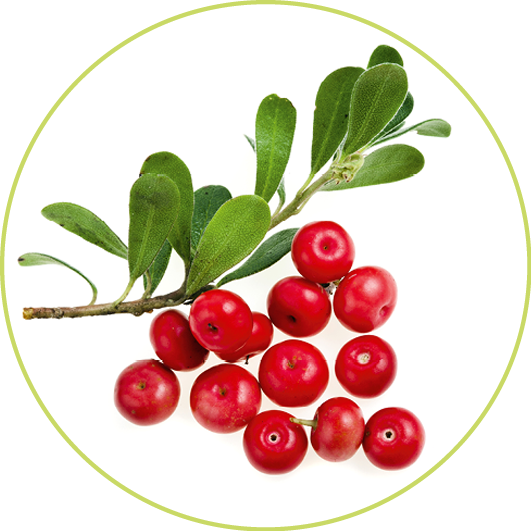 Bearberry Extract, Also known as Uva Ursi, this ingredient is well known for its skin brightening properties. Vitamin B3 (Niacinamide) is shown to be an effective skin brightening agent. Alpha Hydroxy Acids (AHAs) - Lactic Acid and Citric Acid AHAs act as exfoliants, causing the dead cells of the epidermis to loosen and slough off, while increasing cell turnover. 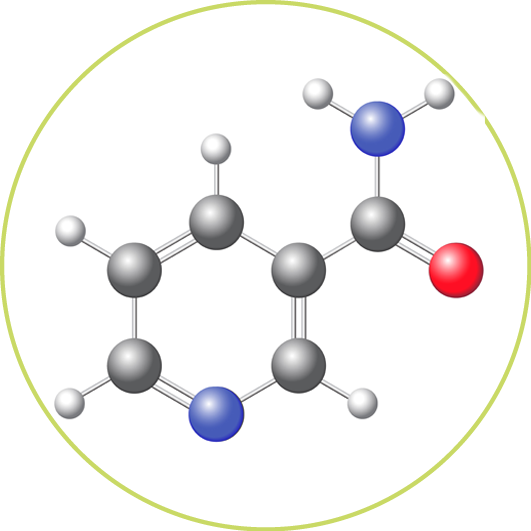 Beta Hydroxy Acid (BHA) - Salicylic Acid Salicylic Acid acts as an exfoliator on the skin and is lipophilic (oil soluble). By being lipophilic, BHAs have the ability to act on the surface of the skin and in addition, the accumulated cells within oil glands, which can build up and clog pores. Methyl Jasmonate, a jasmonic acid derivative has been shown to promote exfoliation. Thirteen healthy panellists, aged between 30-50 years old, with a range of skin types from combination to dry, were selected. They applied the Ultra Brightening product range over the course of 4 months and received professional Brightening Accelerator Mask treatments in-clinic. All panellists used Ultra UV Protective Daily Moisturiser SPF 30 during the day. Panellist LF's results are shown here after applying the Ultra Brightening Range for four months. The apperance of the skin is significantly less pigmented, and more radiant. Texture is refined and the overall apperance of her skin tone has improved. Visibly fade the appearance of pigmentation and enhance skin luminosity with the the Ultra Brightening Range.